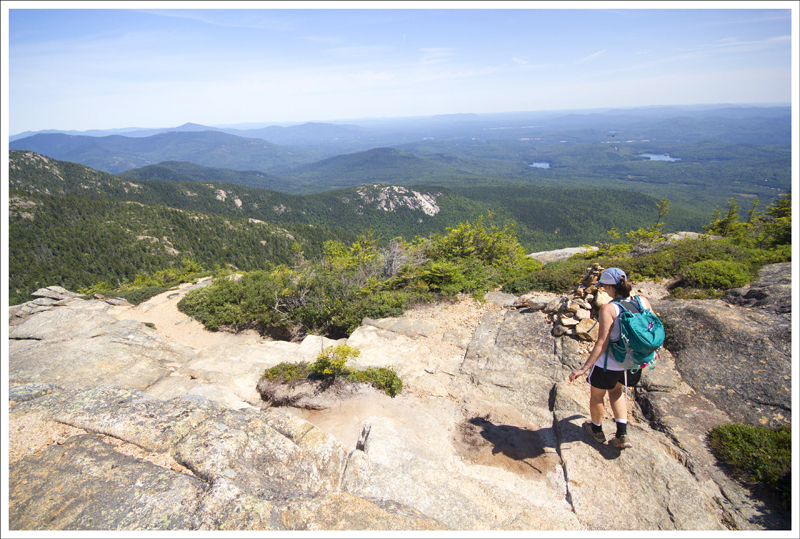 This 7.2 mile hike takes you to a rocky summit with a 360 degree view of New Hampshire’s mountains and lakes. 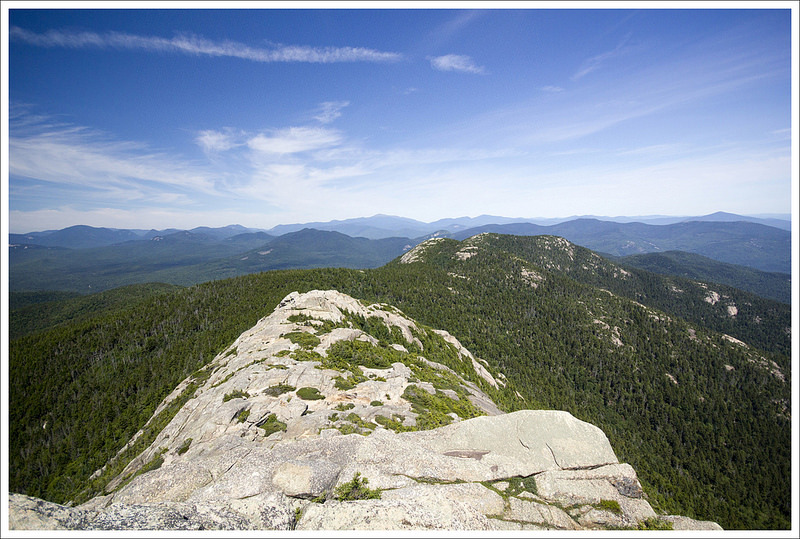 Chocorua is the easternmost peak in the Sandwich Range and stands at just 3,490 feet. 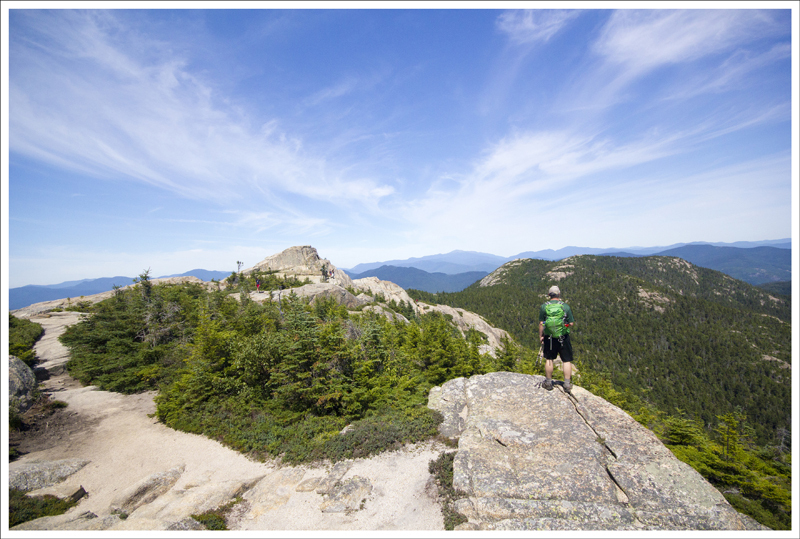 It’s not one of New Hampshire’s famous 4,000-footers, but we found the views were spectacular and the summit offered unique terrain. 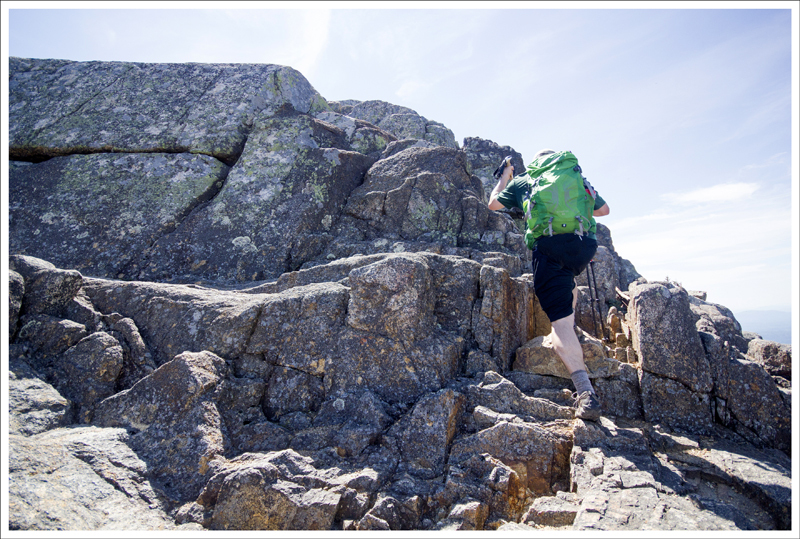 The trail is mostly moderate but requires some trickier rock scrambling near the summit. The Summit of Mt. 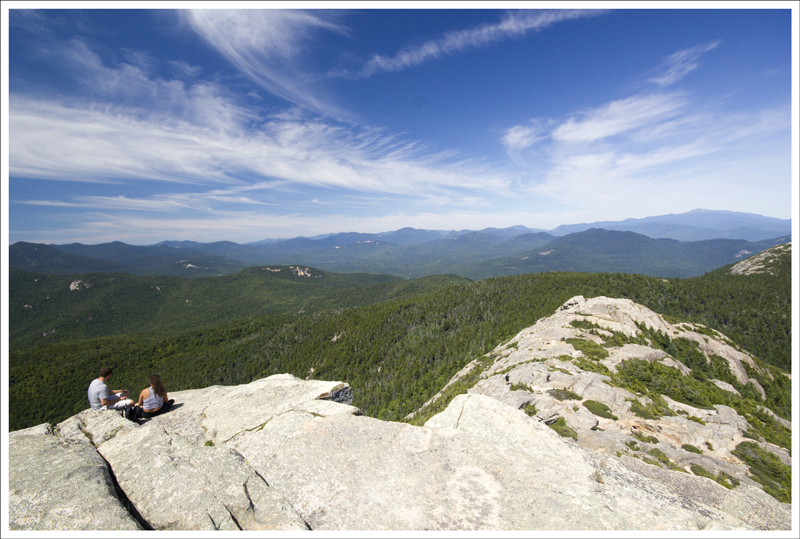 Chocorua offers majestic views. When we visited New Hampshire in August 2016, we got to chatting with a couple locals on the summit of Mt. Cube. They were surprised that we’d hiked so many lesser-known trails in the area, but had somehow overlooked popular Mt. Chocorua. We’d passed the trailhead many times, but had no idea it offered such spectacular views. Adam had taken to calling it Mt. Cocoa Puffs, which is significantly cheerier than the legend of how the mountain got its name. Supposedly, in the 1720’s a Native American man named Chocorua had a son who was accidentally killed after drinking poison on a white settler’s farm. He took vengeance and killed the farmer’s wife and children. The farmer shot and wounded Chocorua, but he escaped up the mountainside. From the summit, he cursed all white settlers, their livestock, and their crops; and then leapt to his death. Like most legends, there are no records to authenticate the tale, but Wikipedia listed a couple different versions of the curse he made. 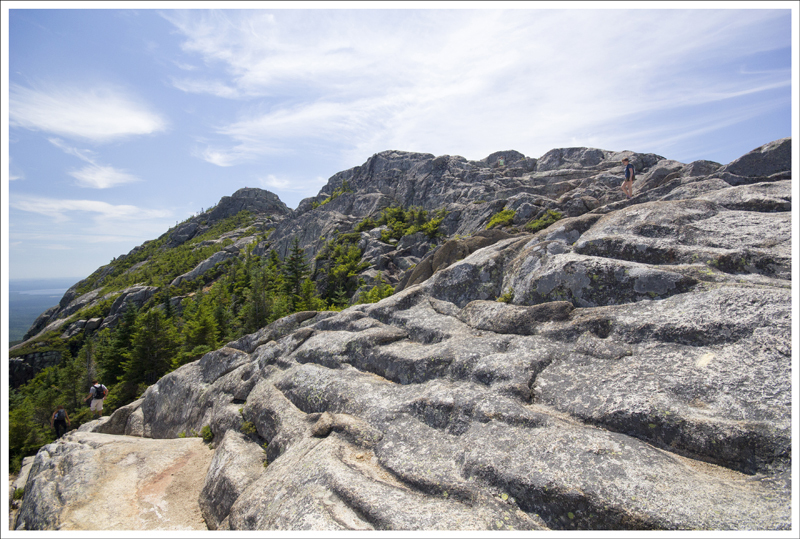 We hiked this peak on a hot, humid day during an extremely droughty New Hampshire summer. 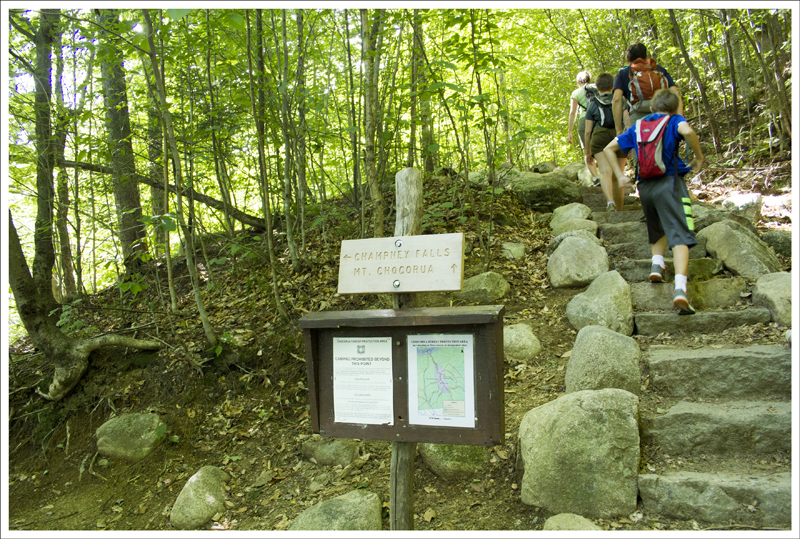 The trail started off at the Champney Brook – Bolles Trail parking lot along the Kancamagus Highway. During fair weather, the parking lots fills by lunchtime so plan to get an earlier start. There is also a small recreational use fee ($3 in 2016) for parking. Payments are made at a self-service envelope station, so you will need small bills/cash to pay for parking. The White Mountains are in drought conditions. Twin Brook was completely dry where it crossed the trail. 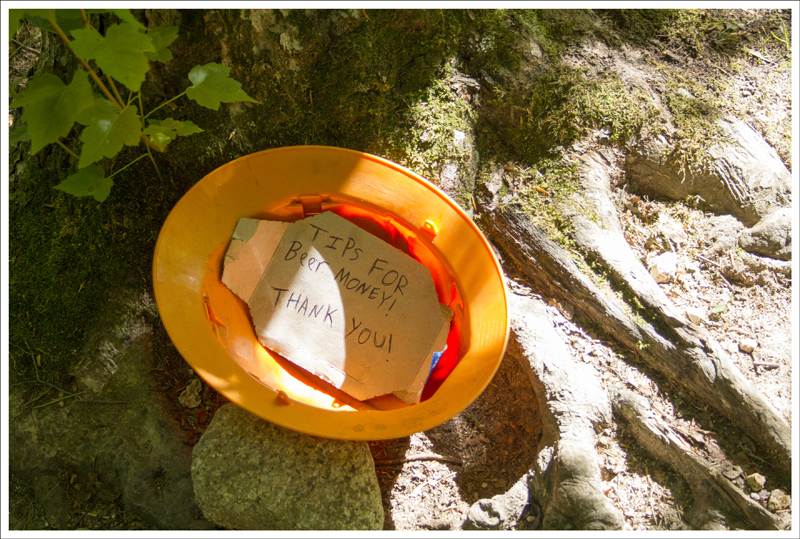 Below: The early trail was a mix of roots and dirt; Constructed stairs on the trail at the junction to visit Champney Falls and Pitcher Falls (we skipped the falls, assuming they’d be dry); The trail crew working that day was hoping for tips! The hike begins on the Champney Brook Trail. You’ll almost immediately cross Twin Brook. There used to be a wooden footbridge over the brook, but it washed away in March of 2013 during heavy rains and snowmelt. Crossing was no problem when we visited – the brook was bone dry and nothing but a bed of cobblestones. At .1 miles, you’ll pass the junction with the Bolles Trail. 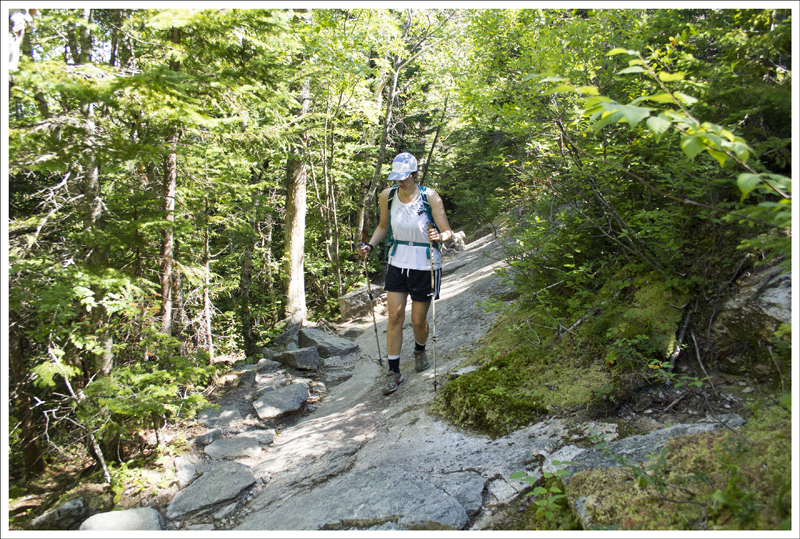 Pass this and continue following the Champney Brook trail. At .25 miles, the trail will meet up with the brook. The trail and brook run parallel for about a mile. 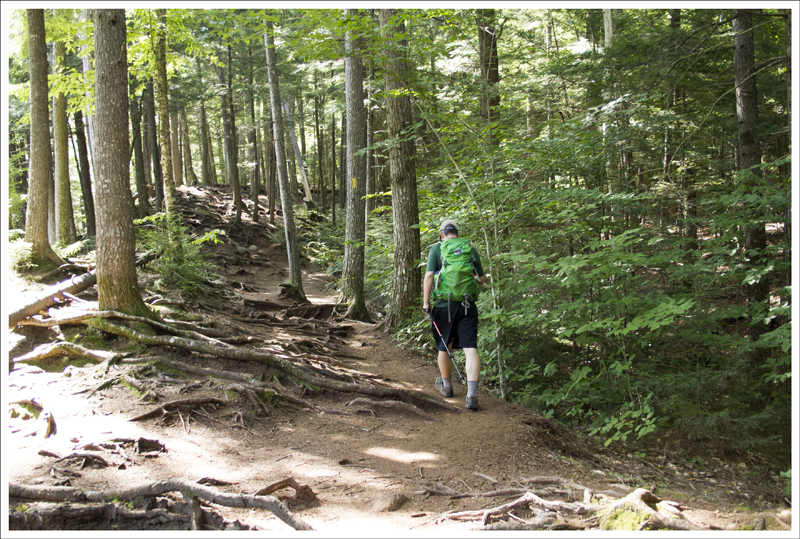 At 1.3 miles, you will reach a junction with the Champney Falls/Pitcher Falls spur. The spur trail departs to the left and follows the water more closely before rejoining the main Champney Brook trail once again about .3 miles later. Since everything was so dry, we decided to bypass the two waterfalls and continue our climb up the mountain. 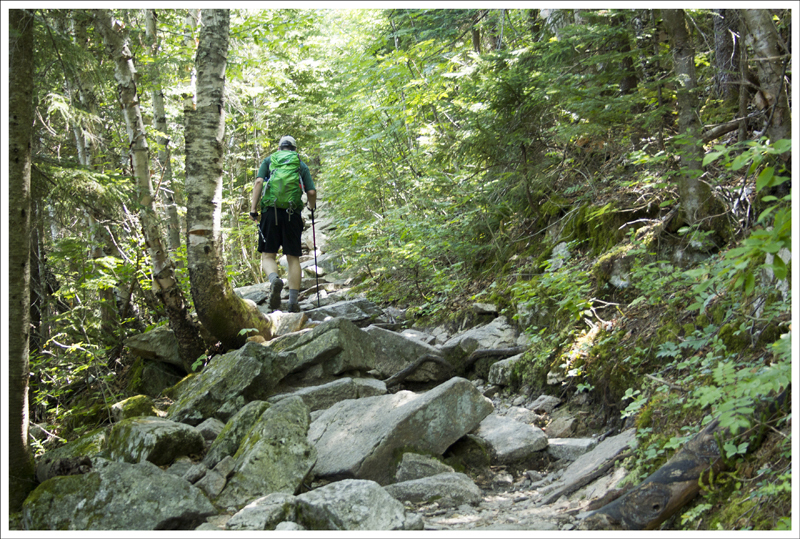 Once you pass the waterfall spur trail, the climbing becomes significantly steeper and rockier. 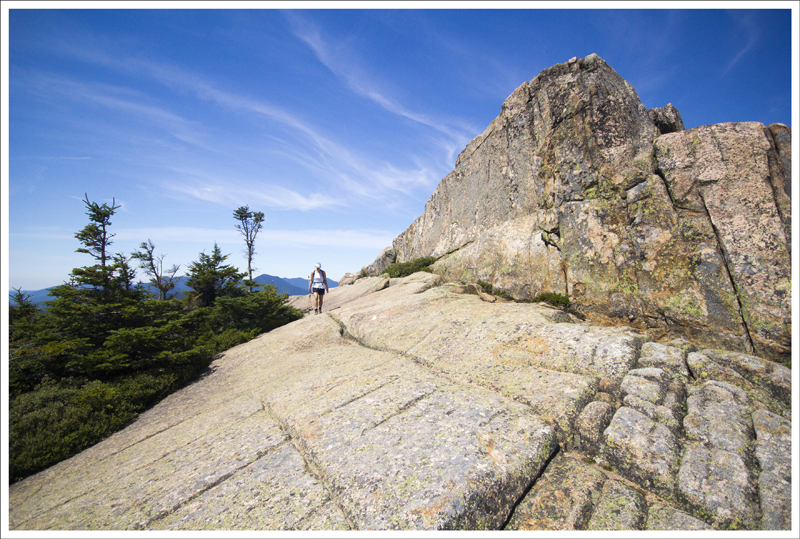 The terrain is made up of a mix of boulders, cobbles, and slabs of granite. At around the 2.4 mile mark there is a good view to the north on the right side of the trail. If it’s clear, you’ll have nice views looking toward the Presidentials. We spent some time relaxing and enjoying the sun on this ledge. 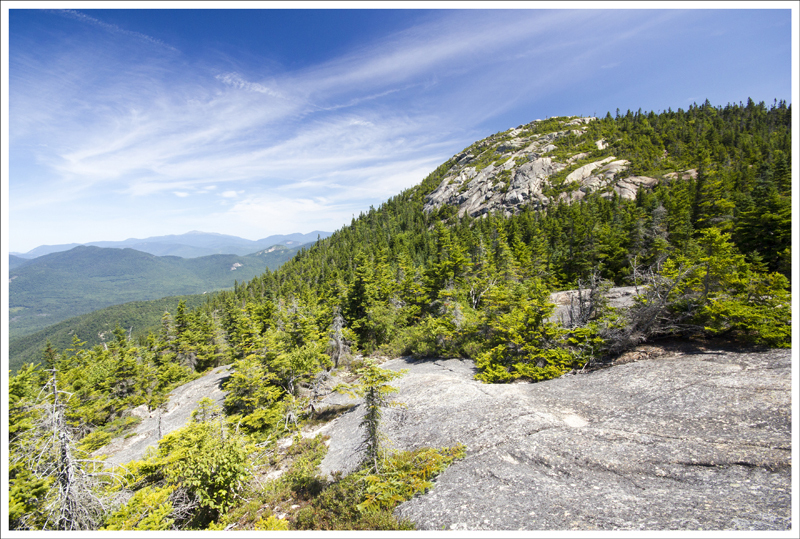 After leaving this view, you’ll ascend seven steep switchbacks over about half a mile up to the junction of the Champney Brook trail and the Middle Sister Trail. Bear to the right, staying on the Champney Brook trail for .1 mile where you’ll reach its terminus at the junction with the Piper Trail. Our first views through the trees. We’re pretty sure the tallest peak is Mt. Washington. Below: As we ascended the trail became significantly rockier. The terrain was a mix of cobbles and slabs. 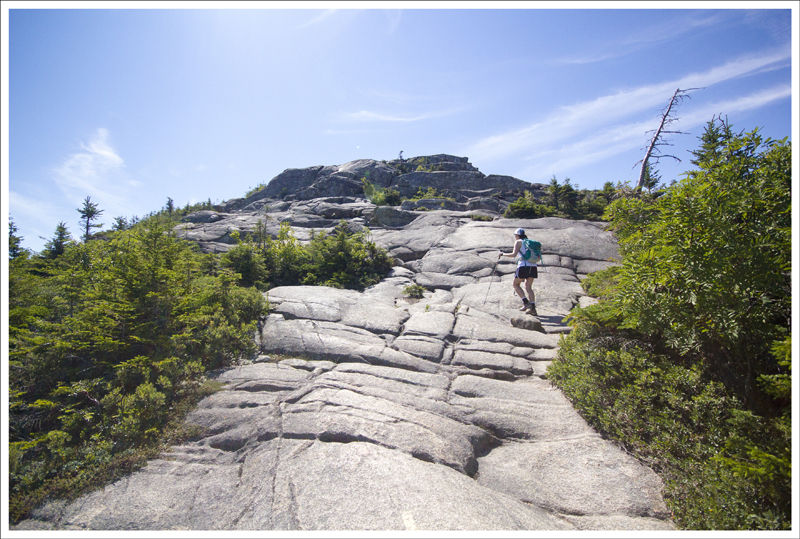 Follow the yellow-blazed Piper Trail for .6 miles over open rock ledges and crags. Some parts will require scrambling on your hands and knees to negotiate the climb. The view keeps getting better and better as you go. I personally found some of the rock scrambling to be a bit frightening. I have some vertigo issues and there were several places I felt like I might fall backwards and go tumbling down a cliffside. My hands were shaking and I felt panicky. But, Adam (and most of the other normal people) seemed to have a fun time climbing, so clearly this is a ‘me issue’. At the top, we enjoyed a fantastic view of what seemed like all of New Hampshire. We could see many lakes and peaks in every directions. 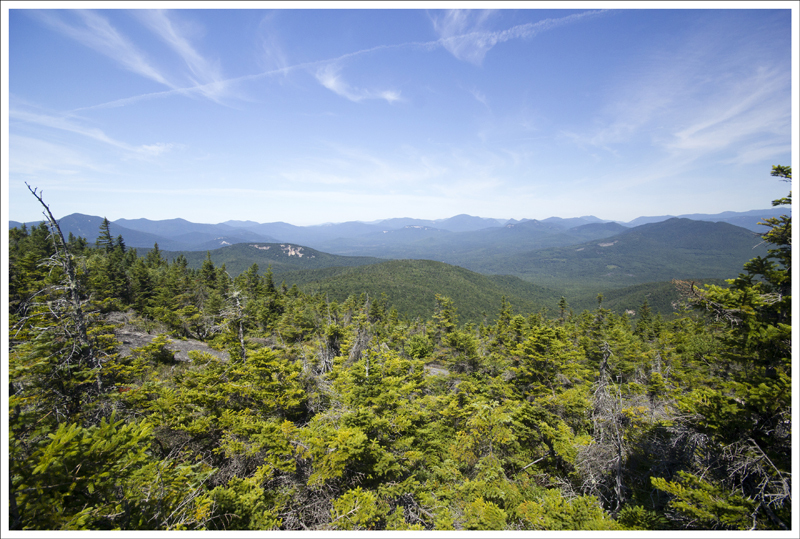 The day we hiked was pretty clear, so we even had a great view of distant Mount Washington. The hike down came a lot easier for me and I enjoyed the wide, theatrical presentation of mountain scenery on the descent. We soon dipped back into the woods and made quick time climbing down to the parking area. On the ride home, we passed through Holderness where we stopped at Squam Lakeside for lime cream slushes and lobster rolls – a treat well-earned by a couple of tired hikers! A View of Middle Sister. 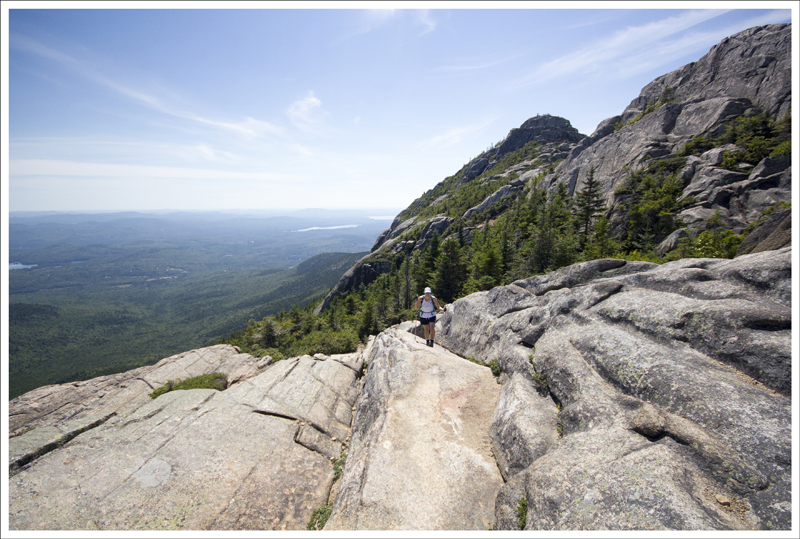 Below: Nice views from a ledge below Middle Sister Mountain; Making our way up to the summit of Chocorua. 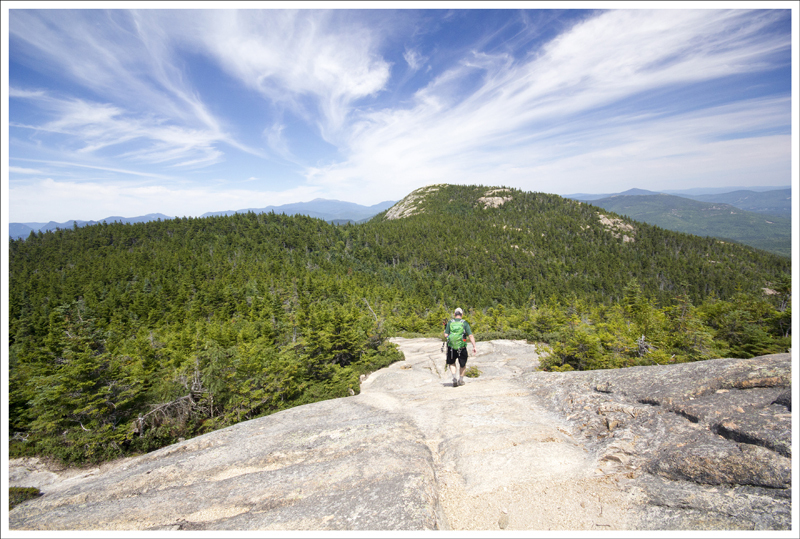 We love hiking in New Hampshire! There are so many amazing hikes to do up there and this one has to be one of my favorites for views in the “Live Free or Die” state. We picked a perfect summer day to hike this which gave us clear skies to take in the sprawling majestic landscape around us. Climbing Mt. Chocorua. 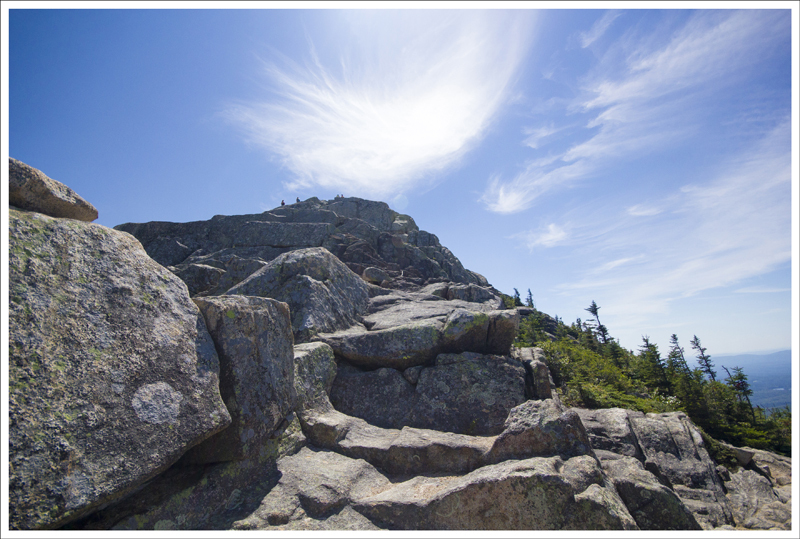 Below: More scenes from the rocky climb to the top. As Christine mentioned, the trail had a moderate climb through the bulk of the hike. 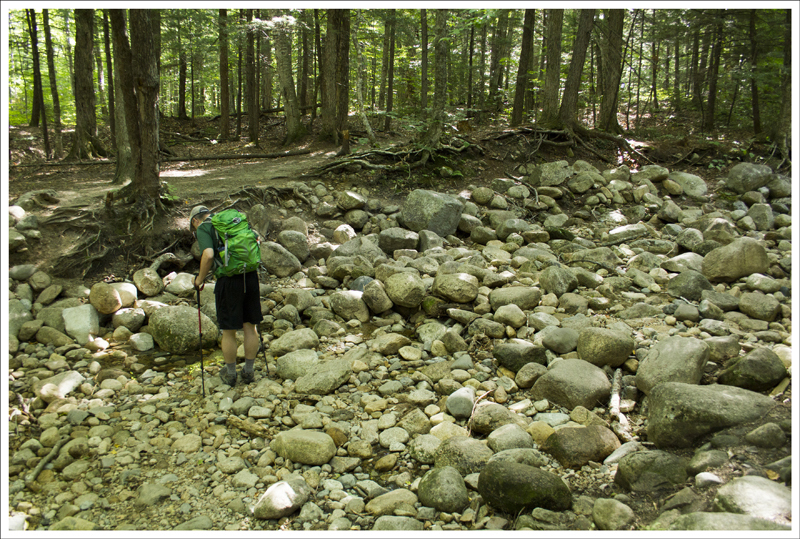 As with most hikes in New Hampshire, you can’t escape the roots and rocks on hikes in this area which make for tougher climbing than what we are used to in Virginia mountains. It was a bit of a slog uphill, but quite manageable. When we got to the view below the Middle Sister, we were impressed with how high we had come up and the views from the open ledge were already magnificent. 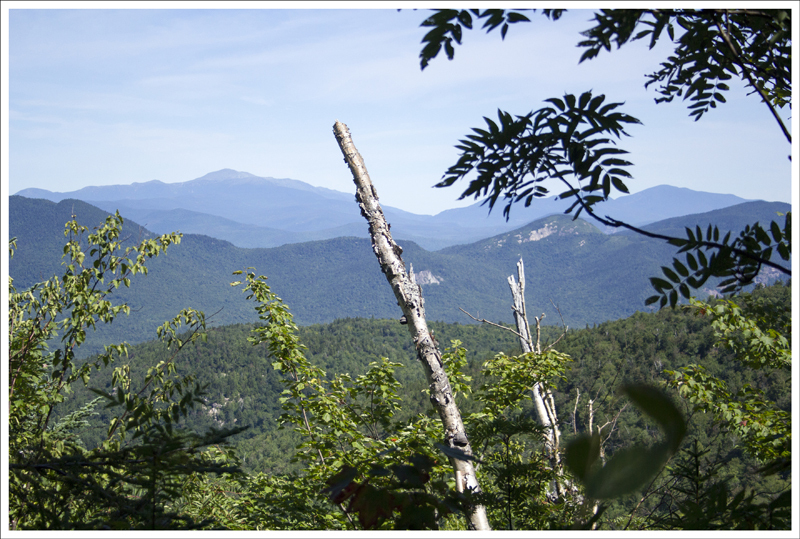 Within a short distance from this overview, we reached the junction with the Piper Trail and made our way to summit Mt. Chocorua. The hike up to the summit is quite tricky. While Christine talked about how it was scary to her, it was a challenge to get to the summit. The blazes at times were a little tricky to follow and you had to use handholds and footholds to navigate up some of the tricky rock scrambles to get to the summit. When we were able to first see the rocky slabs of the climb up, we thought it was a short distance to the summit, but it was a false summit – you get to the top of this first outcropping and then you can see the true summit further up. This would fall in the category of hikes that you hear those warnings of not being for the “faint of heart”. But I will say that if you can muster up the courage, you will be rewarded. 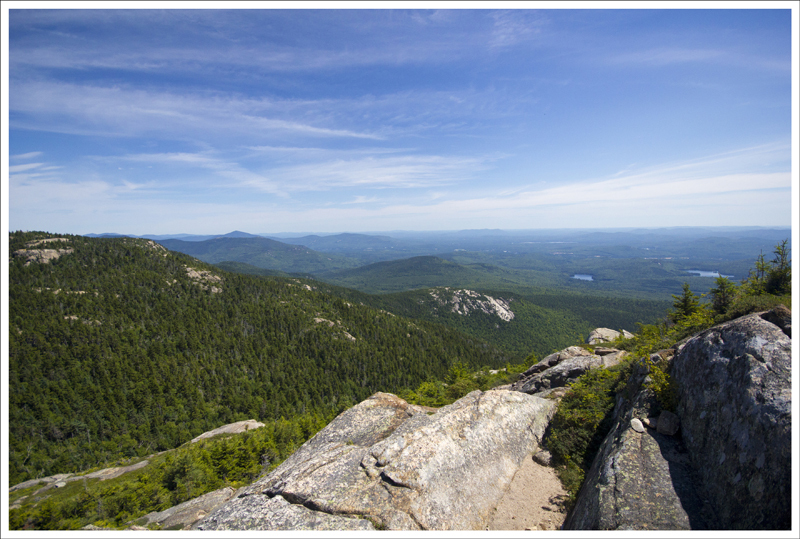 From the north, on a clear day you can see Mount Washington sitting atop the Presidential range and from the west, you can see the Tripyramid, Mount Tecumseh, and Mount Whiteface. The 360 Degree View from Mt. Chocorua. Below: Summit scenery; A look back at the summit from below; Making the descent. Another thing I discovered when researching this hike was there used to be a three-story hotel called the Peak House that sat at the base of the summit. It was built in the late 1800s and served meals and provided lodging for those that were hiking Mt. Chocorua. It was, quite literally, blown off the mountain in September of 1915 from heavy winds (keep in mind this isn’t far from Mt. Washington which is known for some of the highest recorded winds in the world ever). Supplies for the Peak House were brought up by oxen, horses, or manpower and the blueberry pies made from blueberries picked on the mountain, were legendary to visitors. Nobody was staying in the house when it was blown over. 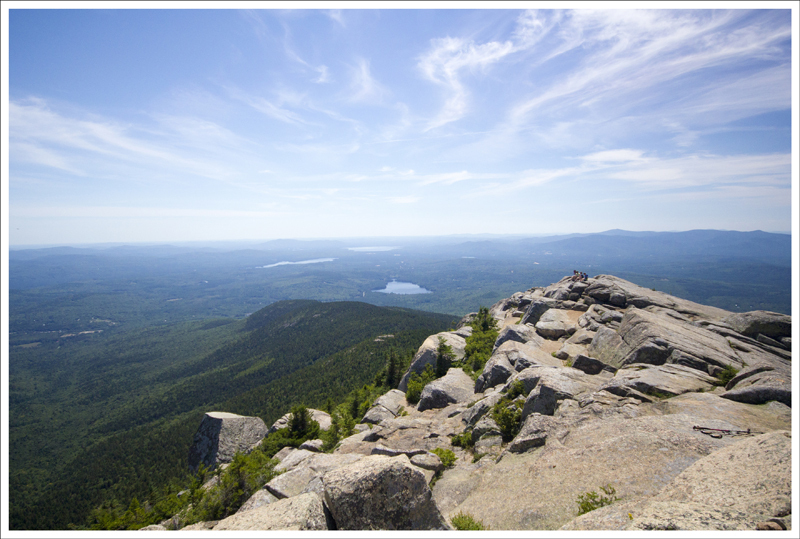 The Chocorua Mountain Club then built a structure to replace it in 1924, but that was also blown over by wind in 1932. The U.S. Forest Service built the Liberty Cabin there in 1934, a smaller structure, that remains today (access is on the Liberty Trail) and can sleep 6 people on a first-come basis. The roof of the Liberty Cabin is draped by heavy chains to keep it from blowing away, similar to what you see in structures at Mt. Washington. This story reminded me of Monty Python and the Holy Grail, where the father is telling his son about the castle that was built on a swamp and kept getting destroyed. I guess there is some stubbornness that sets in when people want to keep some semblance of the past. I had to do some encouraging to Christine to make her want to fight through her vertigo and reach the summit, but I think she felt the journey was worth it and I was so proud of her for fighting through to make it to the summit. Once she made it to the top, we enjoyed taking in the views and the climb back down was even more spectacular. 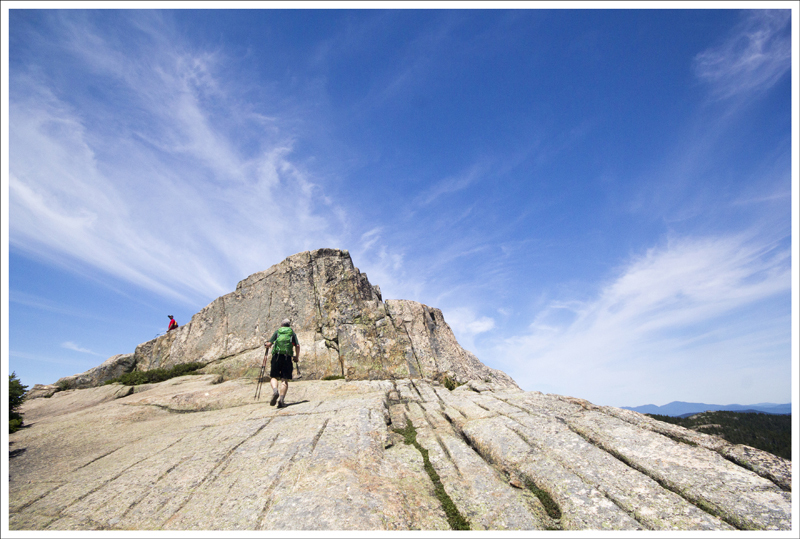 For hikers like us, it doesn’t get any better than spending a day in this scenery. The hike down was just as beautiful. 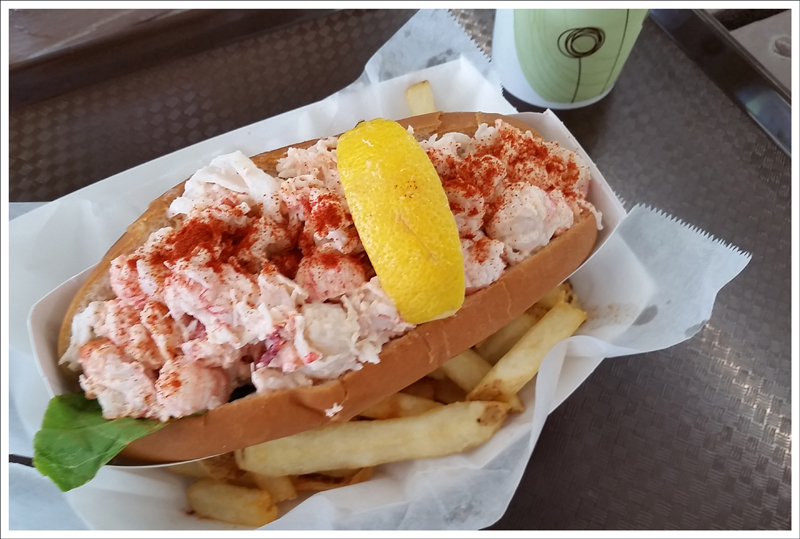 Below: Scenes from the descent; Post-hike lunch of lobster rolls! Difficulty – 4.5. Much of the trail is moderate, but the scramble at the top increases the difficulty factor a little. Trail Conditions – 3.5. 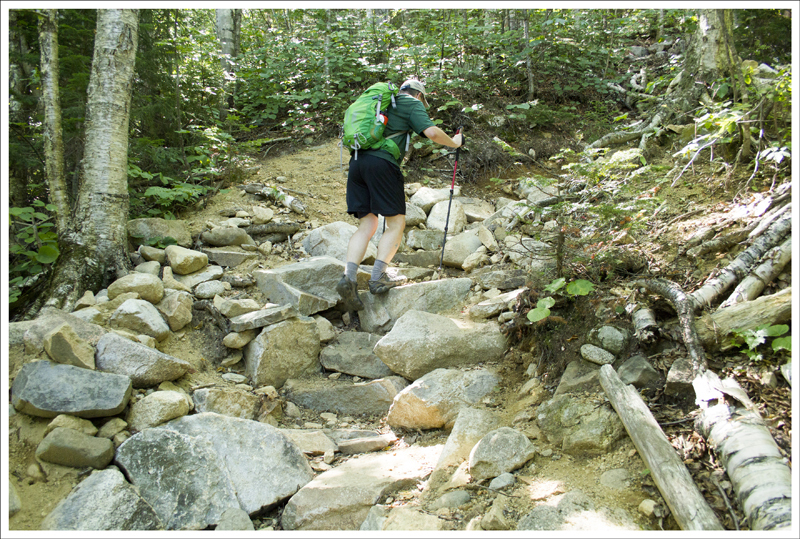 The trail is well maintained, but rocky like most of New Hampshire. Crews were out doing maintenance on the day we hiked. Views – 5. One of the nicest views from a smaller mountain. It’s truly a 360 degree view. Waterfalls/streams – 2. This score may very well have been higher, but we visited during a period of severe drought. The streams and falls were dry. Champney Falls has a reputation for being pretty during spring snow-melt, but is generally considered underwhelming compared to other falls in the area. Wildlife – 3. We saw lots of birds and red squirrels. Ease to Navigate – 3. There are a few turns to pay attention to, also the scramble to the top is not well marked and it can be tricky to find the best hand and foot holds. Solitude – 1. This trail is very popular. Directions to trailhead: Parking coordinates are: 43.990146, -71.299888. The trailhead is on the Kancamagus Highway near Albany, NH. Look for the sign marking the Champney Brook Trail – Bolles Trail parking area. 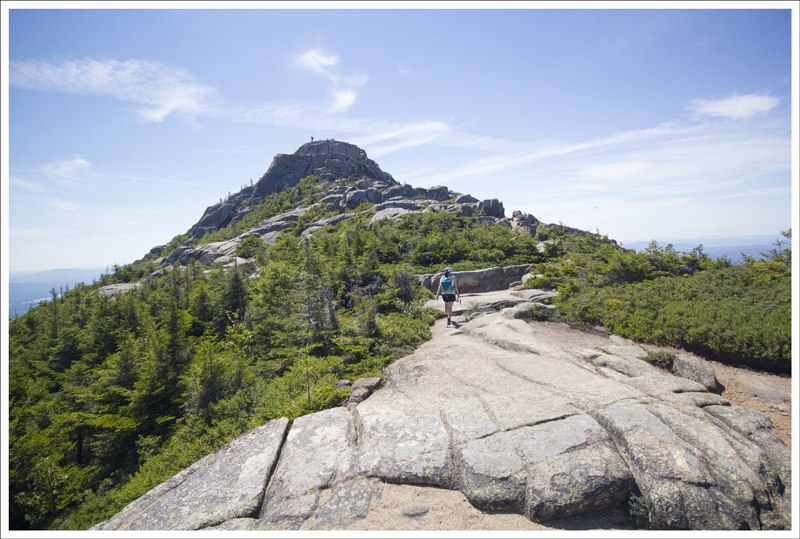 Chocorua is one of my all time favorite hikes. One year I went up twice in the same season. The reason the view is so great… it’s a 3000 foot vertical distance from the summit down to the town of Conway. That kind of drop is rare in the Appalachians. I enjoy your photography and trip reports. Thanks for this one. Thanks for the visit! It really is a spectacular view!